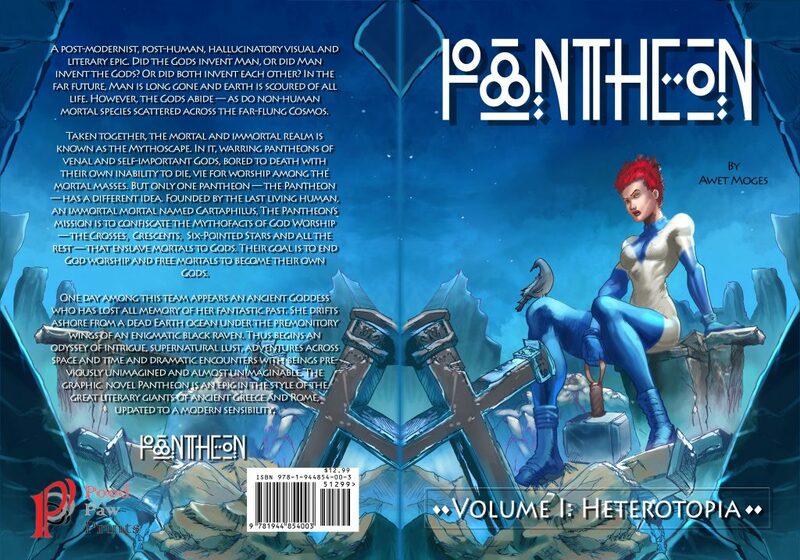 Last month, I finally published the first volume of Pantheon: Heterotopia. This blog is the lessons I’ve learned from writing and drawing it over the last few years. Writing Pantheon, at least the very first chapter, was done in a flash of inspiration, and unlocking a hidden treasure. But it wasn’t until long afterwards that I realized that most of the hard work was done before I even sat down to write – it was the reading and imagining the possibilities for years until it finally crystallized as a true piece of art. Something worth endowing with a thousand perfections and to count my blessings with limitless satisfaction. But this was a serious overestimation, as if the first chapter dripped from the honeyed lips of the Muses into my broken ears. Chapter one was just the opening step. The next step – uncertain and furtive as it was – was the attempt to articulate the idea in a single thought, in a single sentence or paragraph, a page. This became the master-key for Pantheon. And it was the simple idea of reviving mythology with contemporary tropes. Develop a native philosophy, an organic world full of rival factions of gods performing as competing politicians vying for worshipers across hundreds of star systems ripe with billions of souls. Every sentence in Pantheon had to be essentially a derivation or application or interpretation of the maxim. This perfected the thesis and made the writing easier by serving as a guiding star, a Polaris for plotting out the story. Every time I finished a chapter, or a volume, I kept running into demons – am I finished? Empty? But that meant each time I completed a level, I was entering another one, a higher one, and a more challenging one with its own end-boss. The Resistance returned with greater urgency, with even more vicious stratagems intended to stop me at all costs. Worse yet, there was no way to get rid of this fiend. But that was actually a good sign, that I was making progress. This Resistance is par for the course. As the creator, I decided that I was responsible for marketing it – not someone else, no matter if they were professionals. I made my Instagram account a platform for Pantheon by posting new artwork constantly. I grew the audience with a steady drip of new panels and pinups that indicated progress, with the promise of a great product sometime down the road. More importantly? I always kept in mind exactly who I was writing this for – the curious fan of mythology who already read all of the books on myth in the local library but wasn’t satisfied. Yes this was me at age ten, but it kept my focus on the straight and narrow. My brain never stopped thinking about Pantheon no matter where I was, or what I was doing, or what I was experiencing. If something looked like it could contribute to the rich tapestry of Pantheon, I filed away a note. I had to learn to accept the hard fact that the majority of people – even some of my friends would let me down with respect to Pantheon. They were willing to give their opinion, but few ever truly did give advice, and those that did were mostly bad. Good intentions are less important when it comes to constructive feedback. Each and every time I hit a writer’s block, I immediately went back to the sketchbook to draw my way through it. And if that didn’t help I talked my way through it. There’s no such thing as a talker’s block. That worked out pretty well once I set up a Deaf writers group. Still. It was very difficult to plan all the way towards the end – but somehow I did have an idea what it was supposed to be, how it should look in some Platonic otherworld that could never survive the transition to grubby reality. Even though world class publishers like Humanoids rejected Pantheon, it no longer matters in these days of self-publishing. The physical activity that was therapy? Drawing Pantheon, which became its own feedback loop. While drawing the panels, some of my best ideas came to me unbidden. Each writer has a model in mind, no matter who they were. Mine were the great comic book writer-artists of the 80s (Walter Simonson, John Byrne, George Perez, Frank Miller) who greatly impacted my youth. Like anyone else, I wanted Pantheon to succeed right away. But somehow, perhaps intuitively I knew it would require much longer than expected. There was no reason to go anywhere to write – because I could write anywhere. Even though I traveled to Europe several times, this was just another form of procrastination. I did lose my temper several times as a refuge from despair – until I found Cioran, the great philosopher of insomnia and failure who wrote through his insomnia and perfected his formula of existential nihilism. I tried not to talk about Pantheon too much, that I was writing and drawing it, but the questions came when others saw me draw it every day. But the thing was, most will not give me any credit until it is published. There was no way I was going to write anything I didn’t like, and there was no way I took anyone’s advice to change it, if I did. Pantheon was the hardest thing I ever did. I did not just want to write and draw it. I had to. Previous Previous post: Get Off Facebook!